I’ve sent the basic backup without uploads, so the file is down to 46MB! It will probably need the Wordpress to be updated. I left it out in case I made a mistake in that step. Sorry, I couldn’t get past an error about not having the PHP configured for MySQL. I think that gets fixed when Wordpress is updated. The Local log definitely is pointing to something going wrong with MySQL. Just to rule out that everything else about Local is working correctly – @Turnspike – can you create a new, custom site with the various settings that you want to use when importing the site. It looks like maybe PHP5.6 and MySQL 5.6 is what was being used for at least one of those sites. Hopefully, that will verify that Local is able to create a new, blank site. Review the logs folder within the Local sites folder. Is there any information in logs/php/error.log or logs/mysql/error.log? Can you open the original backup and review the wp-config.php file? There might be additional configuration options that were put in that file at the old host. Compare that with the wp-config.php file that is generated by the above “vanilla” site. It’s possible that a plugin is relying on some setting and is crashing on both the front-end and the back-end. Let me know what you find in those places. Feel free to zip up the logs folder and I can take a look as well! 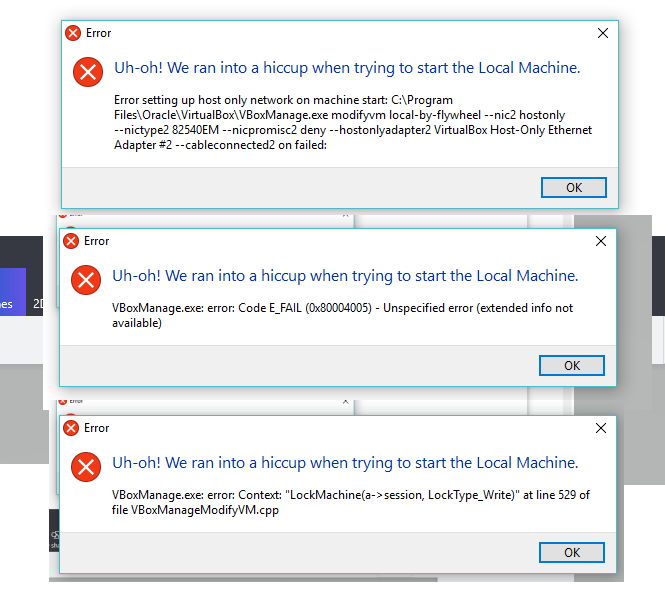 I’m using Local 3.0.3 on a Windows 10 laptop. I’ve been fiddling with settings to try and fix the problems. I found that not having Wordpress up to date was an issue, so I manually copied those files in, but then the site was giving hundreds of errors. I fixed most by dropping the PHP version from 7 to 5.6. I went into wp-config.php and changed ‘WP_DEBUG’ to false. And I found the code below to add to the PHP file which seemed to help. Now when I try to view the site, I see no errors appear, but there is only a white blank screen. No content at all. Same with Admin. Construct a file object given a file path, or create a temp file for writing. Just created a blank site with Local and am only getting 503 errors. There is an update available now, I will download that and see if that helps. Compared the two wp-config files. The only difference I can see that I think may be an issue could be that my site has this, while the new one doesn’t. WordPress Localized Language, defaults to English. For developers: WordPress debugging mode. Change this to true to enable the display of notices during development. Change this to true to run multiple blogs on this installation. It could be something else, but then I’m not a behind the scenes expert at all. I just like to have software that I can use. Hey @Turnspike – Thanks for those logs! I think what is happening is that something is crashing MySQL during the import process, and then when Local tries to use wpcli to do various configuration updates, it is unable to because MySQL is offline. But basically to overcome that error, you’ll need to remove those tables. In a SQL dump you can find and delete any sql statements that relate to the *_wf* tables. From here, Local should be working correctly, if it isn’t then there is something deeper going wrong that needs to be addressed. If Local seems to be working, then you can turn your attention to getting the site setup. Give a try and dragging and dropping the backup to import it, but from the wp-config.php differences, it looks like it may be a multisite installation, which will likely be more difficult to fix. You might want to review this forum post: Multisite Migration Live to Local for more info on migrating a multisite to Local. Let me know how resetting Local works, and if you are able to create new, plain WordPress sites. Also let me know what you find out when trying to import the site into the reset setup of Local. Ok. Reinstalled Local. I was able to create a new blank site, so that’s nice. It’s quite slow. That may be due to my machine, and perhaps that is having an effect on my large imported sites too? Still need to look into the Wordfence problems etc. As I say I’m not much of a techie, but these step by step instructions will hopefully do the trick.I just hope they work! I’m not too concerned about plugins. If I need them perhaps I can re-add them to the fresh site. My main concern is that I want my articles available. I’m not too fussed about flashy plugins. I think most were for social stuff anyway which will be useless on my local install. After a few attempts it let me in. I guess something hadn’t loaded properly yet. How do I do an SQL dump? Going a bit mad with this. I’ve deleted everything I can find related to Wordfence. Still getting a white blank page. Adding the database to the fresh install gave the same result.